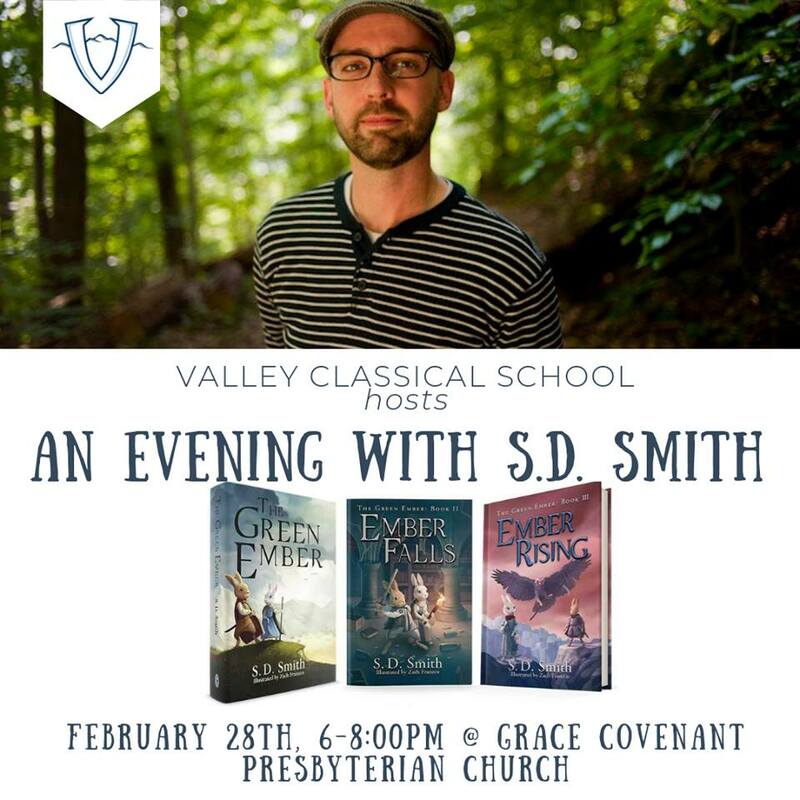 Valley Classical School presents An Evening with Author S.D. Smith on Thursday, February 28, 2019. Valley Classical School is thrilled to host S.D. Smith, author of the acclaimed Green Ember series! We'll hear from S.D. Smith about becoming the characters we love, followed by a Q&A and book signing. Sam is a West Virginia native and is the husband of Gina Smith and father to their four children. Sam hails from—according to Science—the center of the universe, West Virginia. Young readers are invited to dress up as their favorite character from the books. Green Ember merchandise such as books, posters, & swords will be available for purchase at the event. Please RSVP on our website at: https://valleyclassicalschool.org/rsvp. Valley Classical School is located within Grace Covenant Presbyterian Church located at 2101 Shadow Lake Road in Blacksburg, VA.
To view the event flyer, visit: https://i.imgur.com/zxD3q0l.jpg. For more information, visit: https://valleyclassicalschool.org/events/2018/12/3/information-meeting-wgydp-ehby2 or https://www.facebook.com/ValleyClassicalSchool/ or vcs@valleyclassicalschool.org or 540-339-3930.